The mountain we call Lolo Peak is really three peaks: the north (false) summit that we mostly see from the valley, the middle peak, and the south (highest) peak. When one stands on top and looks around, one is struck by the wildness in all directions. To the south, this area is already in wilderness —the Selway-Bitterroot. To the north, it is not. There is no line on the ground to mark the difference! What is special about this place? Its very wildness is at the top of the list. 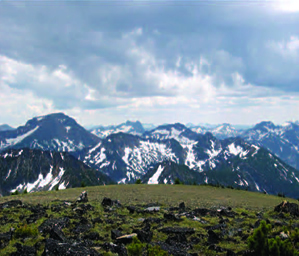 From summer range high into subalpine basins on the mountain’s forested shoulders, to winter haunts where timber crowds the low valley grassland, Lolo Peak is quality wildlife habitat. Beyond quality, it is critical wildlife habitat for numerous species. Good aquatic habitat and water quality support healthy bull trout and westslope cutthroat trout communities. Lolo Creek and its tributaries serve as fish habitat feeding the lower Bitterroot River. Higher-elevation impacts jeopardize this special resource. The area is home to the Carlton Ridge Research Natural Area, a ridge top and gentle-to-steep north slope subalpine climax forest of Alpine Larch and whitebark pine, an ecosystem that has stood the test of time, and is an awe inspiring experience for anyone who hikes there. It provides the increasingly rare opportunity to enjoy unique recreational opportunities in wild country close to a metropolitan area. It is used for traditional recreational activities — hiking, camping, horseback riding, backcountry skiing, winter mountaineering, and hunting and fishing. 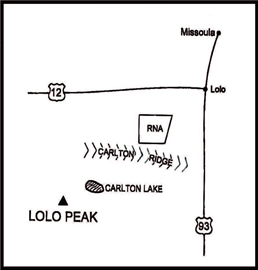 Finally, the Lolo Peak area serves as an historic landmark for citizens of the Missoula and Bitterroot Valleys.